Some of the NIF data management tools are used by both NIF personnel and external collaborators, while others are available only to NIF personnel. Contact the NIF User Office for help in setting up access to the data tools available for your use. Key tools are described briefly below; links to the tools can be found at https://nifit.llnl.gov/. Archive Viewer (see Figure 8-2) is the interface that allows researchers, shot Responsible Individuals (RIs), and NIF personnel to view data from the NIF data repository as a dashboard or in tabular form, or to download data as a zip file or via a WebDAV interface for offline processing and subsequent reloading into the archive. Access to archive data is controlled and granted by the NIF program leads. An experiment setup is split up into a number of data groups in order to facilitate review by expert groups. The Approval Manager (see Figure 8-3) provides reports for the reviewers and tracks the status of each review. Once they are all complete, the tool provides the means for the NIF Operations Manager to export the experiment to the control system for execution. of the NIF laser and target chamber meets the defined experimental requirements. NIF personnel use the web-based LoCoS system (see Figure 8-4) to track installed parts from the facility level down to individual parts. It also captures and manages calibration data for target diagnostics, targets, and parts. Figure 8-4. 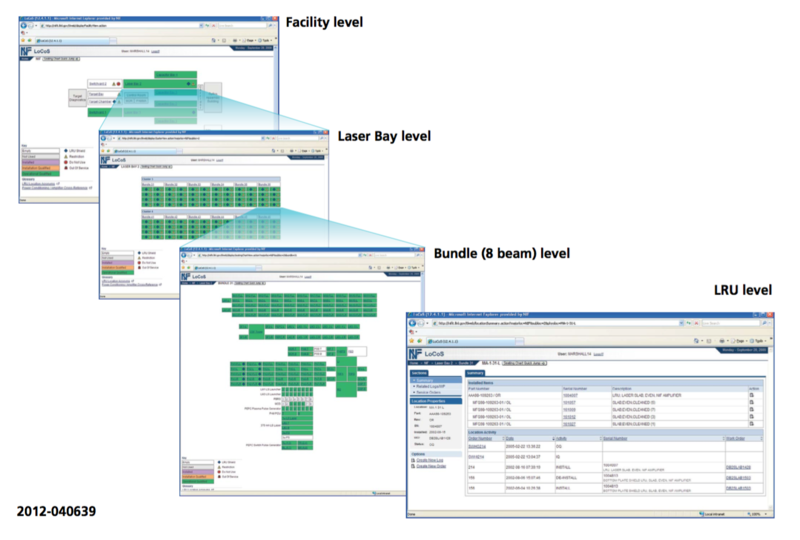 Location, Component, and State enables National Ignition Facility staff to track parts at various detail levels, from facility level to individual parts. The NIF Wiki (https://nifit.llnl.gov/wiki/display/vc/Home) was created as a tool to improve collaboration and communication amongst the scientists using NIF. It provides a single, central location for quickly storing and accessing a diverse set of information and knowledge related to experiments. The wiki stores user-generated content in a free- form format (presentations, documents, tables, charts, etc.). It is closely coupled to NIF’s data repository. This connection enables users to navigate quickly and easily between official shot data and scientific analyses and interpretation. Primary features of the NIF Wiki include the shot log, shot pages, campaign summaries and performance charts, meeting pages, and presentations. The shot clock (see Figure 8-5) allows NIF personnel and visitors to monitor the progression of the experiment as the NIF control system implements the experimental parameters defined in CMT. Figure 8-5. Shot Clock showing the progression of an experiment through the execution phases of the control system. The Shot Planner (see Figure 8-6) is NIF’s principal tool for shot schedule creation. It is also a way for RIs to define the experimental setup at an early stage, to share the setup with expert groups for analysis, and to communicate optic, target, and diagnostic needs with the factories. Figure 8-6. The Shot Planner shows the proposed configuration of the 90-78 Diagnostic Instrument Manipulator. 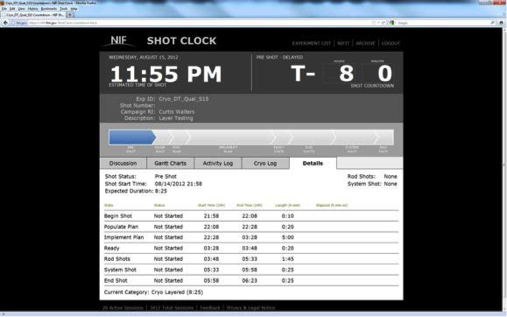 The Status Board (see Figure 8-7) provides users with information about the shot currently being executed, the schedule for the week, and the facility sweep status. The tool is displayed on monitors throughout the NIF buildings and is also available online through a Web browser. Figure 8-7. The Status Board displays the weekly schedule status.